Rock tunnels may be excavated by machines or by drilling and blasting. Cost is generally the deciding factor except when public relation issues govern as shallow rock tunnels in urban areas. Utility tunnels utilize the bore to install the service conduit, be it sewer or fresh water pipe, steam pipe or power cable duct banks. The remaining space generally needs to be backfilled. Placing a totally liquid backfill that can run thousands of feet and fill in every void, especially after drilling and blasting, has enormous advantages over conventional methods. IMPERMIX® fills this role perfectly as a slow setting, non-shrink grout, low heat, light weight grout. The very low permeability and chemical resistance are the best protection for any buried service. Thousands of feet of tunnels have been backfilled with IMPERMIX® in 2003 in Atlanta for the new municipal drainage system. Case Study:	a 48" valve at the start of a sewer rock tunnel going across the Boston harbor from Nut Island to the Deer Island treatment plant, was to be connected in the future to a land tunnel and had to be protected over a period of 5 to 10 years from the saltwater environment. The solution was to entomb the valve in a chamber (240 feet deep) filled with IMPERMIX®. 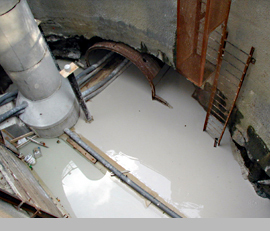 The 240 CY chamber was backfilled in less than a shift, IMPERMIX® being mixed at the top of the access shaft. Five years later, the chamber was re-excavated by another contractor (same project manager!) using spade jack-hammers as originally contemplated, and the valve was exposed in perfect condition. Note: The sufficient but reasonable strength of such backfill (150 psi) allows for easy re-excavation in the future for modernization of this system without having to mine another tunnel.